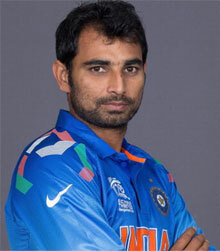 Mohammed Shami (born 03-Sep-1990; Amroha, Uttar Pradesh) is a right-handed batsman and right-arm fast-medium bowler, who plays international cricket for India. He made his International debut in ODI against Pakistan at New Delhi on Jan 06, 2013. 23-Jan-2019: Mohammed Shami becomes fastest Indian bowler to claim 100 ODI wickets, he overtake the record previously held by Irfan Pathan. Pathan had reached to 100 ODI dismissals in 59 matches while Shami reached the landmark in his 56th game.